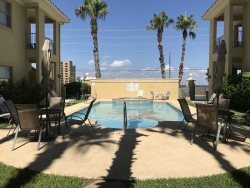 South Padre Island luxury at its finest! If you are looking for an exclusive, upscale beach front resort, look no further than the Solare Tower. This high rise building boasts fantastic Gulf of Mexico views from every room, elegant furniture, and countless amenities to enjoy. 6 adults and 2 children is the maximum amount of occupants. Wristbands are required to be purchased during peak season dates. No Spring Breakers Allowed. Central Air, Ironing Board, Linens, Wireless Internet Access, Brand New Upscale Furnishings, Spacious LR,DR, and Kitchen, washer/dryer available.